Do Game Critic Awards Predict A Game's Retail Success? Game Critics Awards are one of the most sought after badges of honor in the gaming industry, but does wining Best of E3 predict a retail success or impact the sales of a video game? Do E3 Awards Really Matter? "While there have been a few exceptions, overall we found that "Best of" award winners in categories such as "Best Console Game" and "Best in Show" have been retail hits in the U.S. (e.g. have sold in excess of 1mm units lifetime since release according to NPD)." 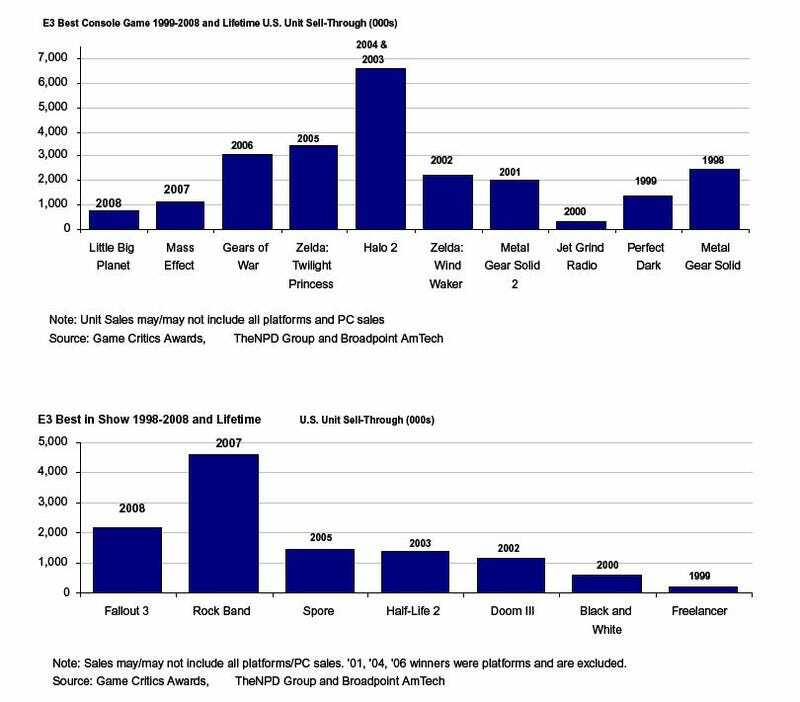 Certain categories, such as Best Original Game and Best Racing Game, were more hit or miss than others in predicting sales success, the analysts say. That's because, they said, these sort of games have "qualities that appeal more to industry insiders/game critics on the panel (forexample, innovative gameplay and art direction) vs. the average consumer." While interesting, I wonder if the awards predict a sales success or help to create one. Lots of publishers have in the past used the award in their marketing of the games.